The day before Jaelan Phillips played in the Army All-American Bowl, where he would be watched by millions, the college football prospect took part in a low-key ceremony. The star defensive lineman, who plans to bring his tackling prowess to UCLA in the fall, helped pin rank on his aunt’s uniform during her promotion ceremony. Philips comes from an Army family. Phillips decided to play in the Army Bowl Jan. 7 to honor his aunt, uncle and great-grandfather, all of whom served in the Army, he said. His aunt thought it was also fitting that she would be promoted right before her nephew’s big game, in which the players donned uniforms with “U.S. Army” emblazoned on them. Yet, the military family never pressured the 6-foot, 6-inch, 250-pound senior from Redlands East Valley High School in California to join the Army. “They’ve seen my athletic abilities since I was young, so they definitely encouraged me to pursue those than rather go into the Army,” Phillips said, smiling. Even after being named the Army’s defensive lineman of the year and recording five tackles in the game, Phillips said, he still has much more to do on the field. The Army Bowl also honors the country’s top high school marching band members and ends a weeklong list of activities hosted by the Army. 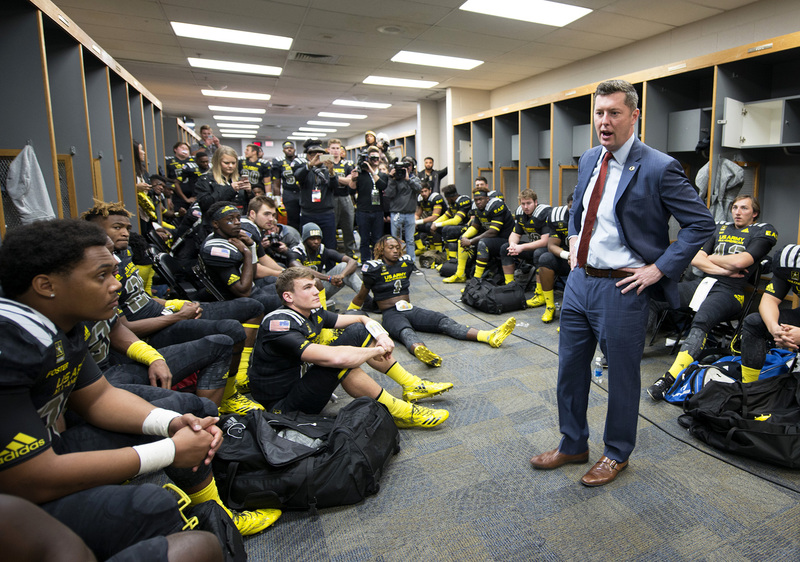 “[It’s about showing] who we are and … what the Army family is all about,” Under Secretary of the Army Patrick Murphy said at the awards show the day before the game. Throughout the week’s events, two dozen handpicked soldier-mentors shared their experiences with the players and band members and served as role models. Sgt. Ryan Moldovan, the Army Reserve drill sergeant of the year, spent a day with Phillips. With many of the players under a great deal of pressure from scouts, coaches, parents and other players, Moldovan said, the soldier mentor’s role is to reassure them and lend them an ear. Though the Army may never get these particular players into its ranks, the Army – called “America’s varsity team” by Murphy – runs the annual event to showcase what it has to offer the American public. “We’ve got to break the civilian-military drift in the nation, when we ask less than 1 percent to serve,” Murphy said. The Army is always looking for the country’s best and brightest to serve as it brings in roughly 130,000 new recruits each year. “We hire more millennials than any other organization in the world,” he noted. Recruiting efforts are likely to increase following the recent announcement of new end-strength figures for the Regular Army, which is set to add 16,000 more soldiers for a total of 476,000 by the end of fiscal year 2017. 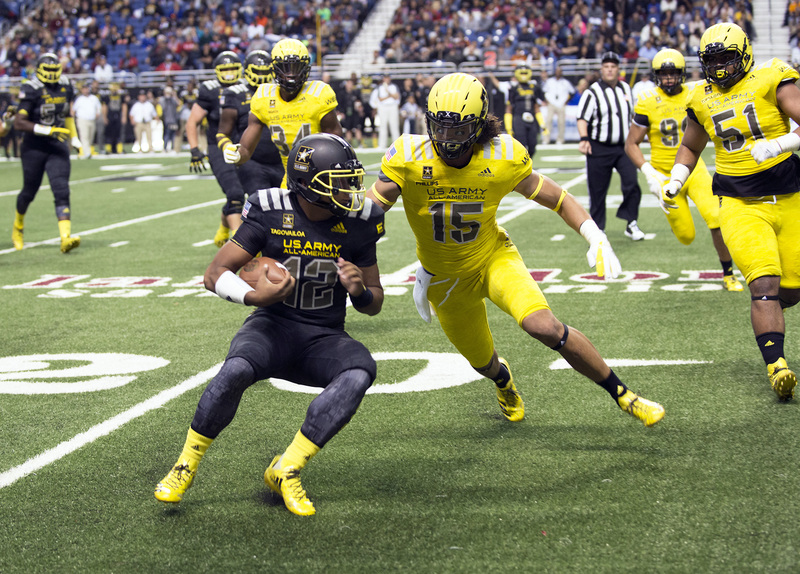 While the Army Bowl affirms the Army’s commitment to gifted youth, the game is also meant draw in new recruits and dispel inaccurate myths such as the one that says Army recruits are young people who have no other options. “Yes, it’s a football game, but the opportunity for it to be nationally televised may cause a young man or woman, or a mom or dad to possibly say, ‘You know what, I ought to consider the Army,’” Snow said.